People walk amid the rubble as they carry belongings that they collected from their houses before they leave Aleppo, Syria Dec. 17, 2016. While the U.N. reported the return of nearly 2,200 families to Aleppo in efforts to "rebuild their lives and livelihoods," experts drew attention to a possible demographic change in Aleppo while noting that the necessary conditions have yet to be established for the safe return of civilians. After the U.N. High Commissioner for Refugees (UNHCR) in Syria Sajjad Malik arrived in Aleppo amid efforts to assess the current situation on the ground regarding the recently brokered, nationwide cease-fire, Malik stated during the U.N. news conference on Wednesday that, "The soul of Aleppo is still there, there is optimism and there is hope." Malik continued by saying, "A total of 115 displaced people have participated in U.N. workshops on basic infrastructural rehabilitation," while underlining that, "Destruction is at a level which is hard to imagine." During a press briefing at the U.N. headquarters in the war-torn city of Aleppo, Malik added to his remarks, asserting that some 2,200 families have returned to their homes so far. However, while the U.N.'s envoy in Syria has claimed that Aleppo residents have returned, experts stress that, "It is technically impossible for the residents of Aleppo to return to their homes before a political resolution has been established." A prominent expert on Middle Eastern policy from the Foundation for Political, Economic and Social Research (SETA) Can Acun told Daily Sabah, "It is highly suspicious to claim that there are civilians returning to Aleppo." Acun emphasized that the Assad regime and its allies have tried to establish demographic change while targeting opposition fighters since the beginning of the Syrian civil war, "Especially in the areas near Damascus," he added. 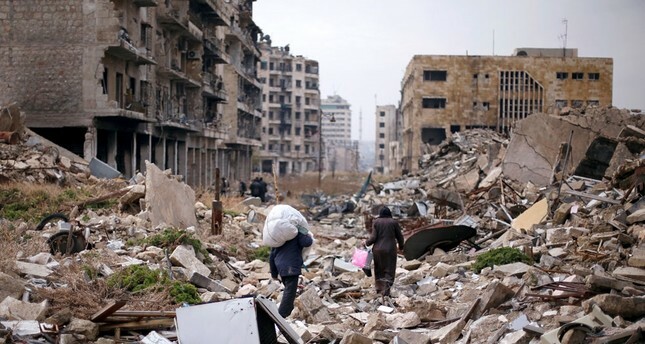 "Those civilians in support of opposition forces have been forced to relocate, becoming refugees due to the mass destruction to city infrastructure while the Assad regime and its allies carry out heavy bombardments targeting civilians. On that note, it is also evident that those Shia militias fighting on the regime's side have brought their families and placed them in these areas with the support of Iran. Currently, there are allegations of a similar process being used against the opposition and civilians of Aleppo, which includes the resettlement of Iranian and Afghani Shia militant family members to areas of Aleppo, thus causing the demographic shifts." However, he did affirm that such demographic change may be possible, especially considering the fact that it is currently impossible for civilians who support opposition forces to return to their homes. The SETA expert did also note that those who returned may also be regime supporters who had left during times of heavy attacks. "It is technically impossible for the pro-opposition civilians to return to Aleppo because it is under siege," he said. Analogous to Acun, Oytun Orhan, an expert on the Middle East, with emphasis on Syria, at the Center for Middle Eastern Strategic Studies (ORSAM), an Ankara-based think tank, stated, "Demographic change in Aleppo is possible," especially when considering previous attempts to compel such shifts in other regions of Syria. Orhan stated that Iran is trying to establish a corridor from Syria to Lebanon and noted that, "Eastern Aleppo is highly critical for Iran's aims in this respect." Though a nationwide cease-fire agreement in Syria was announced, about 10 Syrian opposition groups announced on Jan. 3 that they were suspending talks in Astana due to cease-fire "violations." In this regard, Orhan also said that it is very likely to expect demographic shifts in eastern Aleppo; especially when Iran has intent motives in the region and breaches to the cease-fire agreement are already being committed by the Assad regime. "Those inhabitants of Aleppo will be able to return only when a comprehensive political solution is established in Syria. However, the conditions for Sunnis to return to their homes have yet to be established as they still fear a possible massacre," he said. In regards to public fears of a possible bloodbath, activists from Aleppo reported that the Shiite militia Liwa' Baker, a faction of Syria regime forces, executed a family of 11 on Saturday, including women and children. The family was massacred after they arrived at their home in the Hai Marja neighborhood of eastern Aleppo, according to the media office of the Revolutionary Forces of Syria (RFS),confirming fears for the Sunni population in Aleppo.